Recent months have seen a new spin on the topic of emigration that seems to be ever-present in the Russian online space. Several powerful blog posts written by people from different social groups have become a platform for expressing one's take on the present and future of the country and people's place in it. The issue of massive Russian emigration is more than a century old. In the past, several waves of emigration deprived the country of millions of qualified workers, scientists and writers. Emigration from Russia has never stopped since then. Even with the improving economic situation in recent years, a good number of Russians still dream about leaving the country. 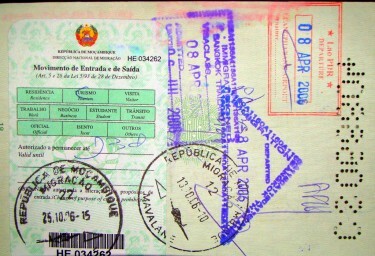 Stamped passport. Image by Flickr user Sem Paradeiro (CC BY-NC 2.0). “Russia is evil in its pure unalloyed form,” began the blog post of well-known Russian author and now emigrant Yuri Nesternko who got political asylum in the United States. Written at the end of 2010, Nesterenko's now famous article [ru] called “Exodus” struck close to the hearts of many Russian bloggers. Having quickly become a must-read for pro- and anti-emigration factions alike, Nesterenko's post is a cry of frustration of someone who tried to live in Russia but could never bear its realities. Nesterenko places significant importance on the Russian mentality and argues that it prevented, prevents and will prevent the country from becoming prosperous. Россия – это не то, ЧТО следует спасать, а то, ОТ ЧЕГО следует спасать. Спасать всех, кого можно спасти, начиная с самих себя. Таким образом, эмиграция является единственным разумным выходом. Хватит уже гробить свои жизни на то, чтобы стать удобрением для российской грязи, на которой все равно не вырастет ничего, кроме чертополоха. Russia is not something THAT needs to be saved but rather something FROM which one needs to save oneself. [We need to] save everyone who can be saved starting with ourselves. Hence, emigration is the only way out. We need to stop ruining our lives and serve as compost for Russian dirt that will never produce anything except thistle. Доступ к интернету имеет не менее трети россиян […]. И как они этот доступ используют? Заполняют политизированные форумы своей ненавистью к Западу, Грузии, Украине, “демшизе”, ну и “жидам”, само собой […], ностальгией по Совку и славословиями Сталину. Западные радиостанции никто не глушит – но кто их слушает? Ведь по ним вещают “враги, которые всегда против России”[…]. Not less than a third of Russians have Internet access […]. How do they use this access? They fill political forums with hatred toward the West, Georgia, Ukraine, “demshiza” [derogatory term for pro-democracy movement delivered from words “democracy” and “schizophrenia”] and, of course, Jews […], nostalgia for Sovok [Soviet Union] and eulogies for Stalin. Western radio stations are not being jammed but who listens to them? Since those are “enemy” broadcasts that are always anti-Russian […]. Blogger Viktoria described herself as a “young woman of 25 years who wants to leave this country.” She wrote a post “Nine reasons I am leaving Russia” [ru] that received 9,000 “Likes” on Facebook, 8,000 reads on popular Russian social network Vkontakte.ru, 1,400 re-tweets on Twitter and more than 2,000 comments. Imagine for a second that something happened and all the government, all officials tragically died in one day. What will happen in a week, in a month? There will be the same faces in the same places. Why? Because people don't change. Because due to the reasons that I fail to understand, our people are like that. Не смешите. Ваши дедушки по 10 лет ждали, когда их арестовывать придут и не дернулись уехать даже в соседний город. А когда их везли на Колыму, ждали амнистию и собирали шелуху у лагерной помойки. И это не «быдло», офицеры, чиновники, интеллегенция… Быдлом стали их внуки. Жирные менты, офисная шваль, путинская гвардия спиногрызов. Никуда вы не уедете. И не потому что у вас денежек нету. Don't make me laugh. Your grandfathers waited for 10 year when they would be arrested and did not leave even for a neighboring city. And when they were taken to Kolyma [en] [region in Siberia known for its Gulag camps], they waited for an amnesty while gathering peels in prison garbage. And they were not even “cattle” but officers, government officials and intellectual elite… But their grandchildren became “cattle.” Fat cops, office riff-raff and Putin's army of freeloaders. You won't leave anywhere. And not because you don't have money. Вам не выжить там, где правит закон, а не ваше любимое БАБЛО. Вам это не понять. Уже на генетическом уровне. Вам не выжить с вашей вселенской злостью среди нормальных людей. Они вас не поймут и не примут. Вы это почувствуете сразу, как приедете жить, а не в отель пожрать включенного халявного пива. You will not survive in the country where the law and not MONEY is above all. You will not understand it. On a genetic level. You will not survive among normal people with your universal hatred. They will not understand you and will not accept you. You will feel it right away when you come to leave here and not stay at a hotel so you can drink free inclusive beer. The enormous popularity of those blog posts on the Russian Internet shows how many people cannot stay indifferent toward this topic. It is also a good indicator of how many netizens are dissatisfied with current situation in Russia. Popular Russian polling service Levada-Center reported [ru] that fewer and fewer Russians think that their country is moving in the right direction. The number of citizens who approve of the job of the government has also been steadily declining. Mentality may be an easy target to blame for many problems in the country and emigration may seem like a fast solution to many young people. But admitting “mentality causes” of Russian reality may also be a small step toward changing the centuries of silent obedience in the face of oppressive kings and corrupt governments. Sometimes I don’t understand why people HATE their home so much. Yes, some things are bad in Russia, some are in even worse. Don’t call a rotten romantic, but I do beleive in the future of Russia. This is something beyond reason, the reason will tell me just otherwise. I don’t know what has happened to people who only weep and scold. Obviously most of them are loosers disregarding what that earn and how the live outside their homeplace. I am an American (ex-expat) who lived in Moscow for 5 years. I would go back to Russia, very willingly. Tomorrow. Russia has many things to love that that the Russian people do not recognize. Their deep culture and beautiful country are really quite magnificent. Really. But I would never want to be old in Russia. It is dreadful how Russia treats its old people. How many times did it make me cry. No, the link is correct.